I don’t know what it is with the oven and me, I just love to use the oven. Before starting the new adventure of baking eggless cakes and muffins, I started simply with cooking store bought frozen French fries and pizzas. 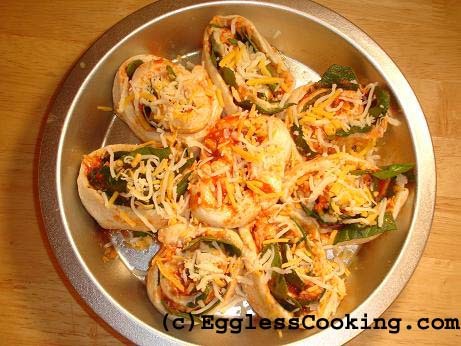 We prefer making them at home because we can control the amount of cheese and increase the quantity of veggies. I’ve not yet tried to make the dough myself. 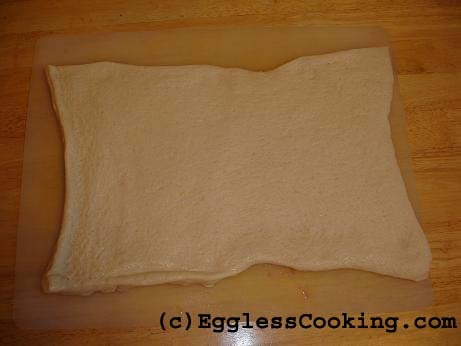 Recently I have also found a simple recipe to make home made pizza dough using whole wheat flour. Can’t wait to try that! But before that a simple one to make at home with store bought ingredients. I saw this recipe in Parents Magazine a couple of months back. I wanted to try this for a long time now, but got a chance only today. You need just 4 ingredients to make this beautiful looking and tasty pie. Refrigerated pizza dough, sauce, any cheese of your choice (I used the part skim pizza blend cheese) and fresh baby spinach. 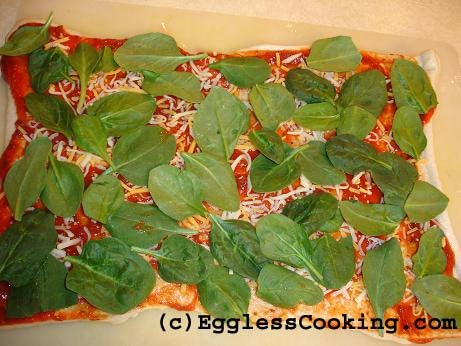 This can also be considered a healthy pizza, because it requires only half a cup of cheese and has spinach. Not bad for a pizza, which has a bad reputation as greasy food. The process is also very easy, but a little messy at the end. The next time I bake it I would add some pepper powder/chilly flakes too. It was very bland for our taste. Other than that, this recipe is definitely a keeper. Kids will also enjoy doing this. Find the recipe here. Preheat the oven to 400F/200C for 15 minutes. Unroll the dough. Spread the pizza sauce and sprinkle half of the cheese. Roll the dough starting with the short end. 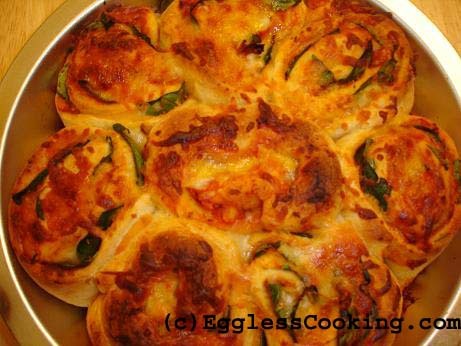 Cut into 8 pieces and place it in a greased pie tin and sprinkle with remaining cheese. Bake it for 22-25 min and indulge! I absolutely love the recipes on your site. They are sooo easy and soo tasty. 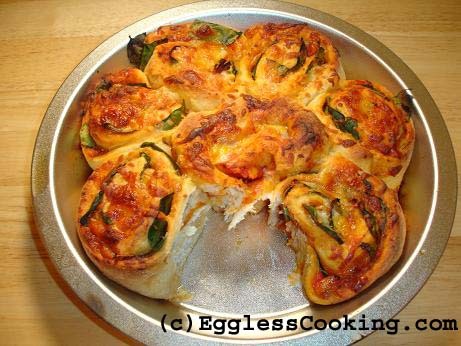 For this recipe, did you cover with aluminium foil while baking the pizza or uncovered? Thank you very much Madhura. I did not cover it while baking. All your recipes look interesting and fun. Thanks! You’re welcome Tanvee and thank you very much for your compliments. I had fun making this with my son. It was easy,fast and delicious! I did add garlic salt and onion powder to it and cooked it at 425 for 35 minutes. Please if you have other easy recipes send them my way. Thanks for trying it and for your feedback as well Sarah. Sent you an email. I use Pillsburry’s Pizza Crust. 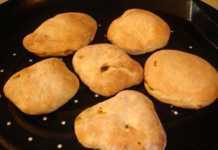 I hear that even pizzeria’s sell the dough alone, I should try that too and make my own pizza dough too sometime. Hi Madhuram, first time to ur blog. it is suberb. 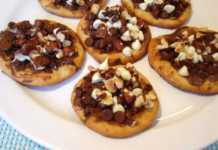 I love ur pizza recipe…will try it soon!! @Siri: It’s healthy one too, with just half a cup of cheese and lot of spinach. But you might want to add something to spice it up. It was a little bland. Try adding some red chili flakes. That looks delicious. I just tried home made pizza for the first time last evening and enjoyed doing it. 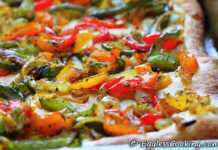 I doubt we can find prepared pizza dough here in Chennai, but this recipe is a keeper. Thanks very much for sharing. Gary, thank you very much for trying the pizza. I really appreciate it. 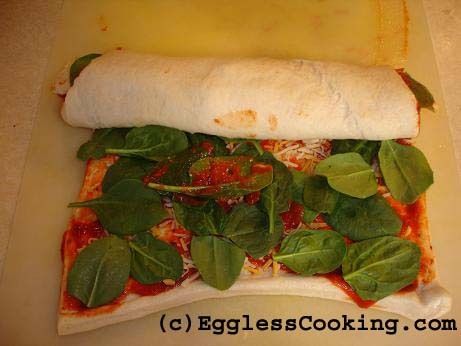 Just use half a cup of sauce and 1 cup of spinach that should work out fine.